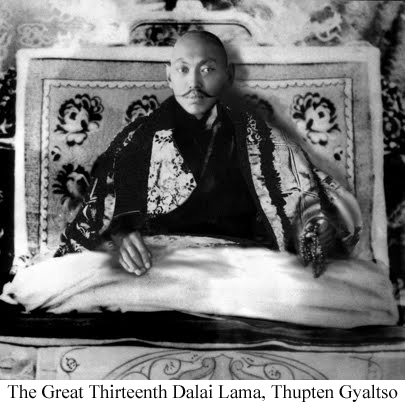 The dawn of the twentieth century witnessed the emergence of a hitherto unseen progressive leader on the Tibetan political horizon in the form of the thirteenth Dalai Lama, Thubten Gyaltso. Born in Thakpo Langdun in southeast Tibet in the year 1876, he was recognized as the reincarnation of the twelfth Dalai Lama at a time when the very prestige of his ancient lineage was on the wane. Entangled in the cobweb of secular power struggle, his four recent predecessors had been reduced to mere nominal heads and their immature demise had time and again left Tibet virtually orphaned. The political spectacle of the country at the time was also far from picturesque with substantial national energy wasted on regionalism and sectarian conflicts while the powerful empires were vying to bring Tibet under their respective spheres of influence. It was, thus, at the height of severe political pandemonium that the nineteen-year-old Thubten Gyaltso assumed full spiritual and temporal authority. Except for the two external interventions (Younghusband Expedition in 1904 and the Manchu invasion in 1910) during the formative years of his reign, his 37-year tenure can be considered to be one of the golden periods of Tibet’s history. Through sound diplomacy and tactfulness, he was able to maintain a balance of power between the Central Asian powerhouses, thus safeguarding Tibet’s independent entity. He was not only a dynamic leader but also a liberal-minded reformer who tried to bring about radical changes in the political, military and social structure of the country with a vision to synchronize the pristine Tibetan society with the developments in the rest of the world. In order to safeguard its so-called strategic interests in Central Asia, the British sent a mission headed by Colonel Francis Younghusband to Tibet in 1904 to negotiate with the Tibetan government. Foreseeing the imminent danger, the Tsongdu advised the Dalai Lama to cut short his three-year retreat and leave Lhasa. The Dalai Lama fled towards Mongolia and thereafter visited Beijing at the invitation of the Qing Empress. He had been previously intimated by the officials in Kham the situation arising as a result of the frequent intrusion on the part of Chinese soldiers in this region; he, therefore, took this opportunity to get an assurance of non-interference from the Empress and perhaps to revive the priest-patron ties between the two countries. But once he reached Beijing he was profoundly disappointed. The Dalai Lama was asked to perform kowtow (the Chinese custom of touching ground with the forehead) before the Emperor in his court and sit on a lower throne besides him, he straightaway rejected the prospect of such an exercise on his part. His strong personality and self-esteem can be traced from this incident. While he was in China he met the ambassadors from America, Britain and Japan enabling him to establish necessary contacts and broaden his limited knowledge about the outside world. By the time he was back in Lhasa, the Manchu army was already on its way to the capital .The Dalai Lama had to flee again, this time to India via Yatung. The Manchu forces under Zhao Erfeng invaded Lhasa in 1910 and their scorched-earth-policy led to substantial human casualties. In India the Dalai Lama sought asylum in Darjeeling where he first made acquaintance with Charles Bell, the political officer of Sikkim who acted as his liaison with the government of India. This was the beginning of a friendship, which lasted over two decades. On 14th March 1910 Thubten Gyaltso called on the then Viceroy Lord Minto and requested him to intervene to resolve the crisis but the British-India rather preferred to remain neutral. The Dalai Lama remained in Darjeeling for two more years before the destiny struck once more, this time in favour of Tibet. The revolution broke out in China resulting in the overthrow of the declining Manchu Dynasty. Consequently, the supplies from the mainland began to elude the Manchu army in Tibet. The opportunity was seized by the Tibetans to drive them out of the country. The long awaited kyipay nyima (the sunshine of happiness) began to bless the people again after a brief period of darkness; and the people eagerly craved for the Dalai Lama to return. Thubten Gyaltso arrived in Lhasa in January 1913 to a hero’s welcome. His experiences in exile had considerably influenced his outlook. He realized the significance of opening up his forbidden country and removing the veil of myths surrounding it. The Dalai Lama proclaimed Tibetan Independence that year and his government signed a treaty with Mongolia in Ulan Bator acknowledging each other’s independence. From as early as 1910, Thubten Gyaltso had embarked upon some reforms. He had issued new silver coins with the name of the Tibetan Government Gaden Phodrang inscribed on them on his return from China and also set up a Foreign Bureau in Lhasa to establish ties with the foreign countries. Soon after his arrival from India, he introduced paper currency in Tibet in the denomination of 5,10,15,25 and 50 tamka. Two students were sent to Calcutta to make a study of the printing of Indian currency and on their return 100 tamka notes were also circulated. For the first time postal stamps were introduced; and the gold and silver coins were minted. He made necessary amendments in the country’s judicial system and abolished capital punishment. He founded a public school for both medicine and astrology in Lhasa with free medication provided for the poor. He knew what a blessing western education could prove to be for his people, therefore he sent four Tibetan students to England to expertise in various fields of technology. With the assistance from the British government he started two primary schools: one in Gyantse and the other in Lhasa. However the schools had to be closed in the wake of continuous objection from the monastic groups who thought such an education would jeopardise Buddhism in Tibet. Thubten Gyaltso also had plans to build road from Lhasa to Indian border and thus connect Tibet with its southern neighbour but the people living along the proposed route appealed to the government to abandon the project citing inability to pay taxes once the vehicles replace their donkeys and mules as a means of transport. In 1914, the First World War broke out in Europe. Through Basil Gould, the political officer of Sikkim the Dalai Lama proposed to send Tibetan troops to help Britain in its war against Germany. Although an army of 1000 best Tibetan soldiers were kept in readiness until the end of the war, the British never gave the ‘go-ahead’ signal. One thing that was at the top of his agenda was the demarcation of Sino-Tibetan border. He incessantly pressed the British into arranging a tripartite conference. The seeds of the Shimla Conference were thus sown. In 1917 he sent Lonchen Shatra Paljor Dorjee as his special representative to the Simla Conference. However, the Sino-Tibetan border still remained obscure as the Chinese representative refused to sign the final treaty. He tirelessly endeavoured to win for Tibet its rightful status of an independent-state in the global arena. He also contemplated joining the League of Nations at the end of the First World War. He envisaged a militarily self-reliant Tibet capable of defending itself against external (Chinese) threat, for that he organized a strong army under the Commander-in-Chief Tsarong. Albeit the Chinese forces had been driven out of central Tibet, there were still few soldiers along the eastern border (Kham) who were causing constant trouble. The Dalai Lama was determined to clear these hostile Chinese out of Kham. In order to overlook the developments in Kham, he started designating Kalons as the governors of Kham. He trained different regiments of army according to the four military systems (Russian, British, Chinese and Japanese). After thorough examination the British military system was thought to be most conducive and the Tibetan army was modelled along the British lines thereafter. He also sent few selected soldiers to Quetta and Shillong to be trained in artillery and machine gun warfare. Maintaining a strong army and ensuring a continuous supply of arms and ammunitions required huge investment on the part of the government. To make the ends meet he then decided to levy an additional tax. Here again the monastic groups, which owned large estates, protested against this policy. Intoxicated by their obsolete beliefs, they rejected militarization of the country, which they thought was against the cardinal principles of Buddhism. In the winter of 1933, the thirteenth Dalai Lama, Thupten Gyaltso left the world for the heavenly abode marking an end to his glorious rule. In his last testament he warned his countrymen that “the night shall be long and dark” if they weren’t sincere towards the nation. He foresaw a difficult future for Tibet if it remained stagnant. He did everything in his capacity to converge Tibet with the rest of the world. But unfortunately his petite steps towards modernity seemed giant strides for his insouciant countrymen. The conservative monastic groups and the ignorant masses maimed most of his reforms in their infancy unaware of the fact that they were inviting trouble for themselves by doing so. Thubten Gyaltso was a patriot and a true son of Tibet. He was a lone warrior in a battlefield full of adversaries, perhaps a solitary lamp in the tempest. Thank you for taking the time to comment on this.